What you start out controlling can end up controlling you. From Twitter to iPhones, from Facebook to tablets, we have an endless supply of media and gadgets to hook our interest, snag our wallets, and occupy our time. Think back over the last five years. How much of your time was devoted to online activities? How much of your real life has been gobbled up or googled up in your net life? 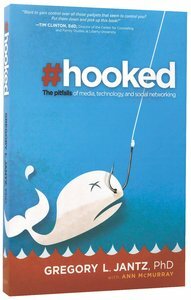 In Hooked, counsellor and addiction specialist Dr Gregory Jantz speaks enthusiastically and frankly about the gizmos and gadgets, social media magnets, and Internet sidetracks we have at our fingertips. With real-life examples and biblical applications, he presents a celebration of the positives technology offers and a cautionary tale about the negatives it unleashes. Gregory Jantz, PhD, is a nationally certified psychologist and licensed mental health counselor, a certified eating disorder specialist, and a certified chemical dependency counselor. Author of more than sixteen books and popular speaker, Dr. Jantz brings his whole-person vision of hope to audiences around the country through speaking, seminars, conferences, radio, and television. Some of his recent books include Happy for the Rest of Your Life; Healing the Scars of Emotional Abuse; Every Woman's Guide To Managing Your Anger and Hope, Help, and Healing for Eating Disorders.